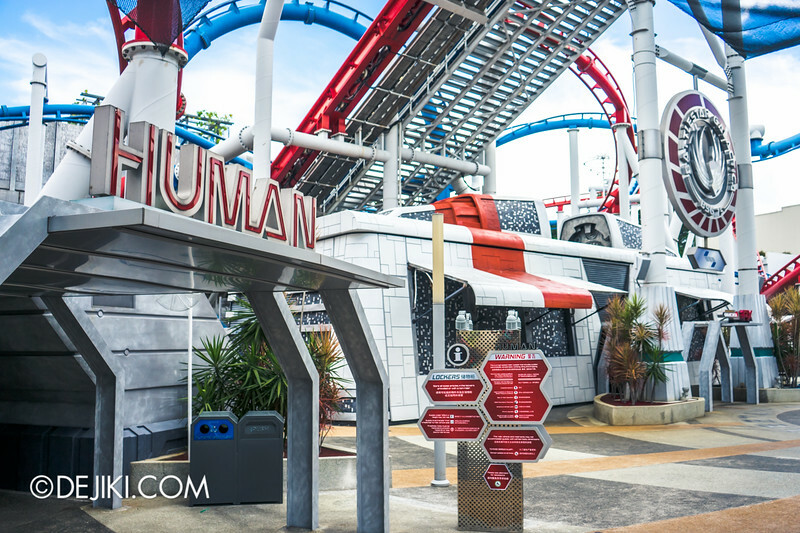 We’ve got some updates on the Battlestar Galactica: HUMAN vs CYLON dueling roller coaster attraction in this month’s Universal Studio Singapore park update. Read more here! BREAKING: Battlestar Galactica: HUMAN vs CYLON will return on 27 May 2015! 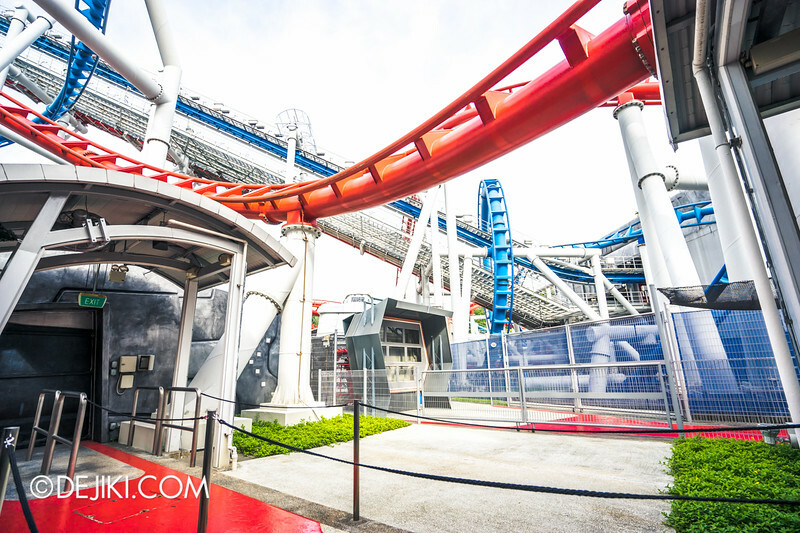 Discover the ride here in our exclusive photo tour of this unique attraction! Despite many rumours that BSG will return in time for the May Day weekend, the ride has yet to reopen. 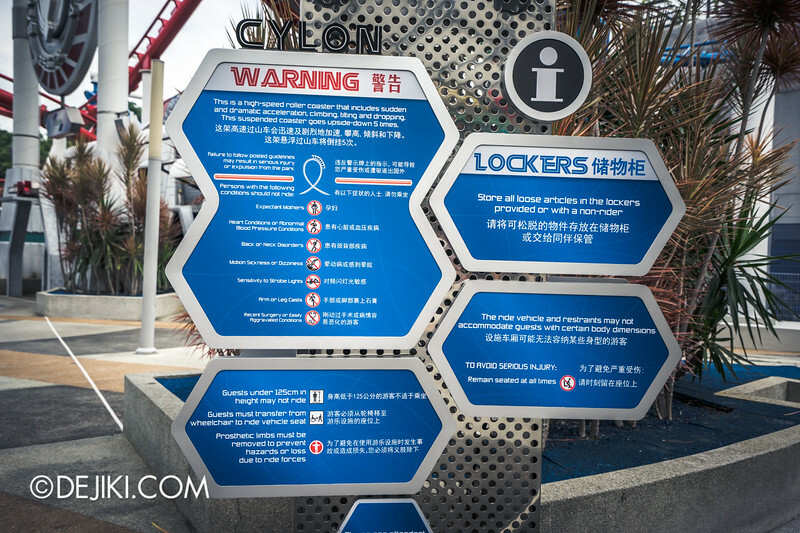 Last week, information boards have returned at Battlestar Galactica: HUMAN vs CYLON. 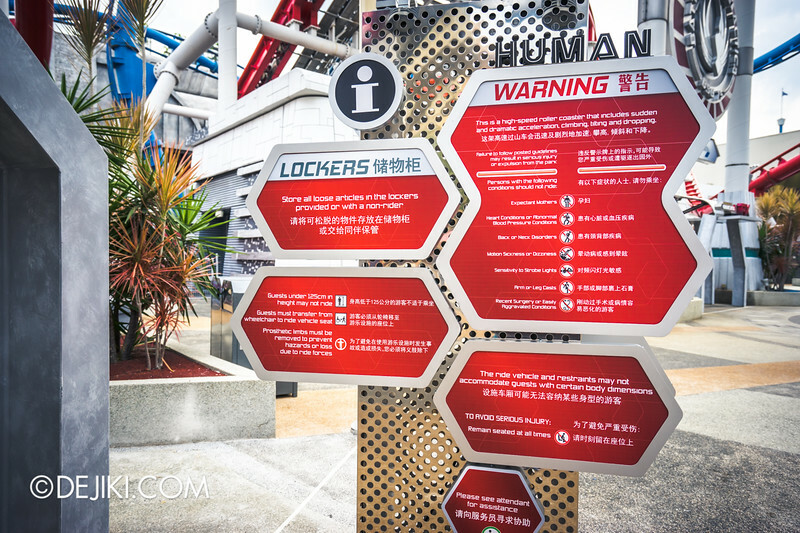 These signs contain safety warnings and guidelines for guests. It looks like the 2011 relaunch signage, but it’s not exactly the same – some parts are updated for consistency and clarity. The guidelines remain the same as before, i.e. minimum height of 125cm to ride. The test seats and height bars were not installed yet, but it’s a good sign that some things are coming back. 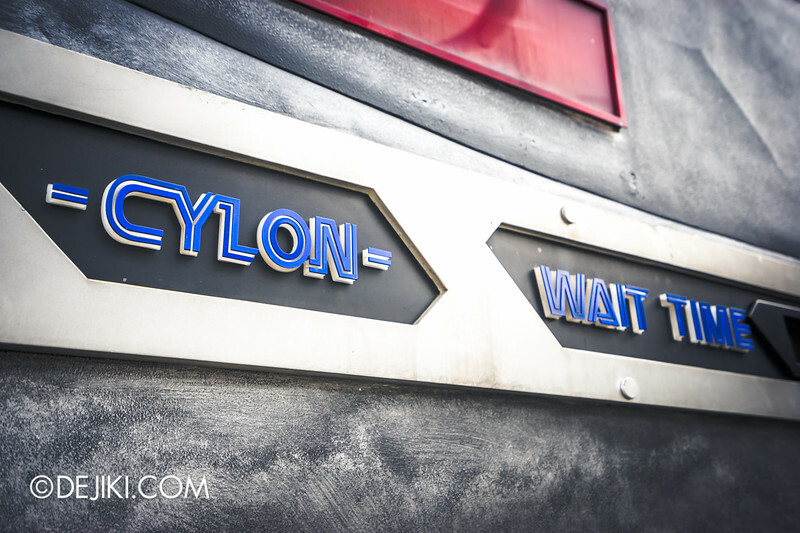 At long last – the wait time signage at the CYLON entrance is repaired. 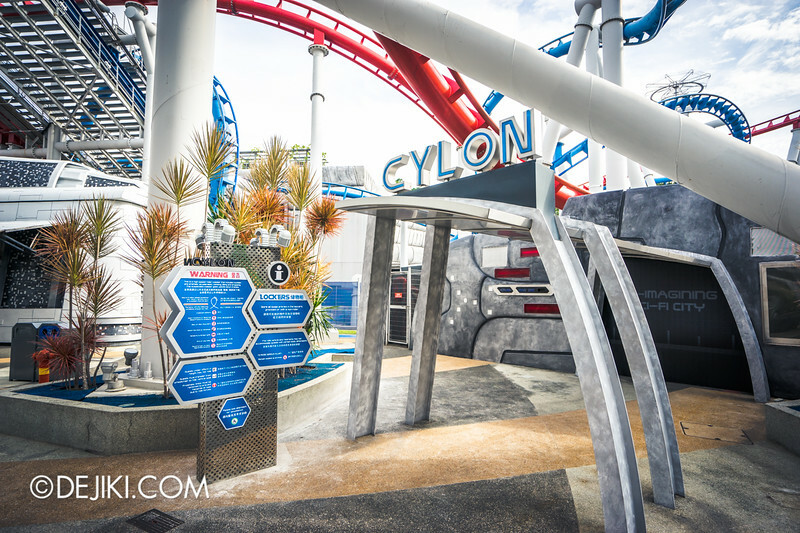 Battlestar Galactica: CYLON is the roller coaster on the blue track. In case you didn’t know, this roller coaster goes upside down 5 times. For the past few weeks, some park fans have mentioned that they rarely see Battlestar Galactica undergoing test cycles. 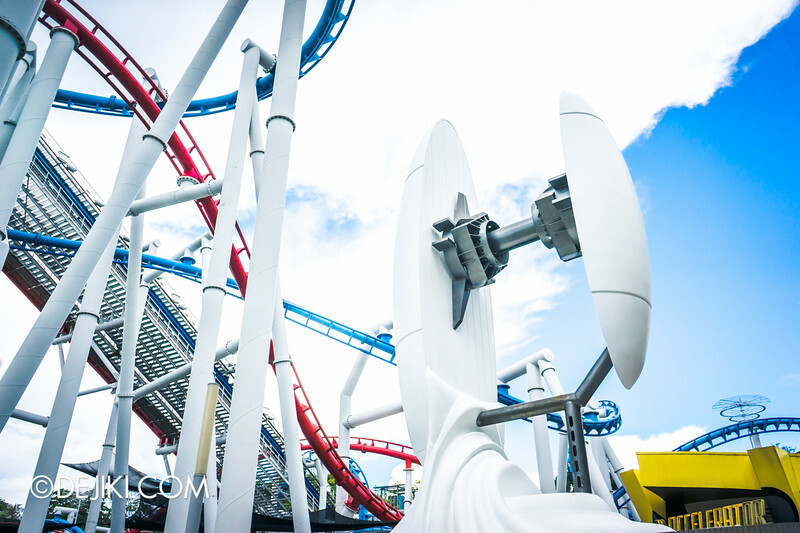 This can mean a lot of things – perhaps both sides of Battlestar Galactica may have completed the test cycles required for certification, or there are other adjustments that we cannot observe from guest areas of the park. 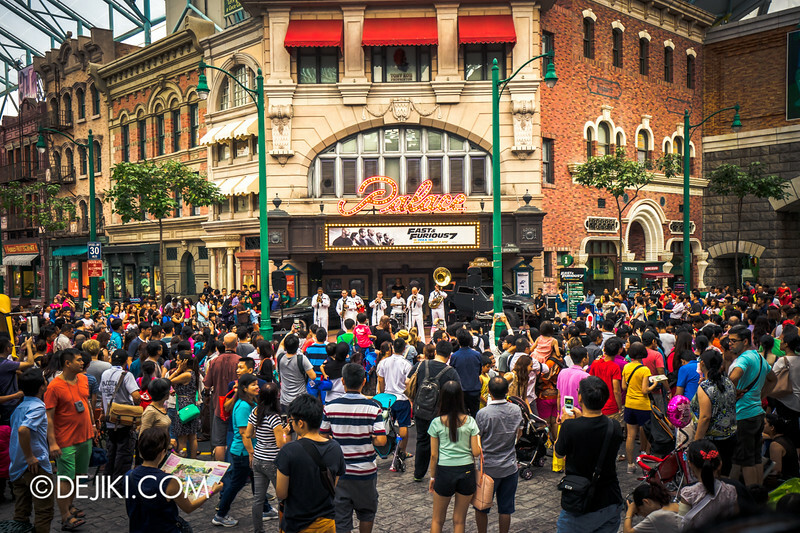 Anyway, it might seem like delays after delays, but the park still has time (till end of June) to fulfill its plans to reopen before the end of Q2 2015. It’s not much longer now. Battlestar Galactica has been observed to be testing sporadically, and the fog pit (where the CYLON roller coaster does a complete vertical loop) is sometimes turned on as well. 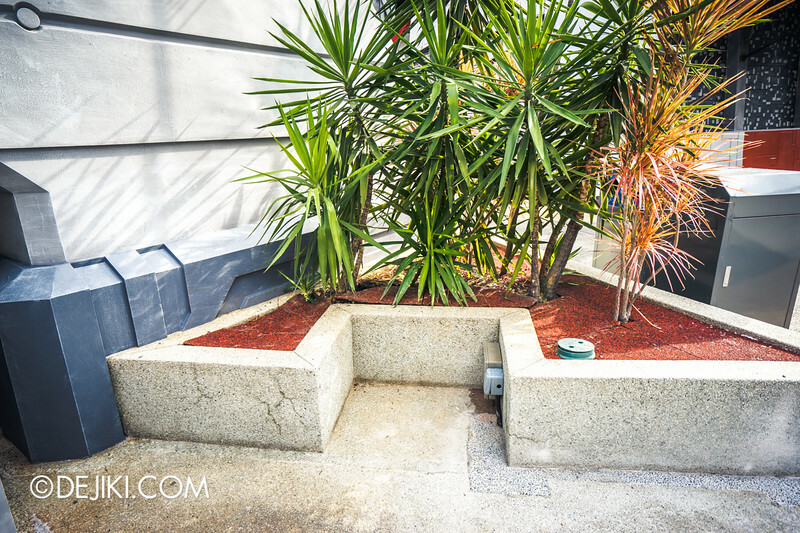 See those bins? They’re hiding something. 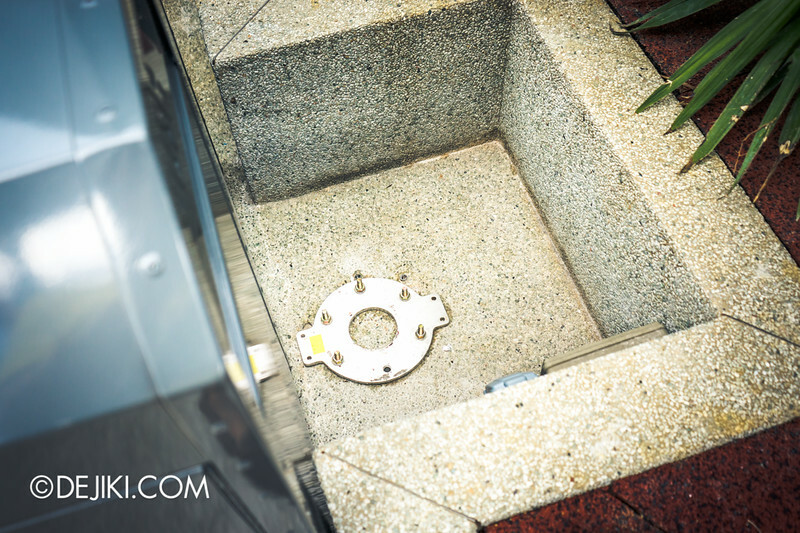 The bracket for the test seats were recently installed. Looks like the wall of displays (showing photos of guests taken on-ride) will not be returning. 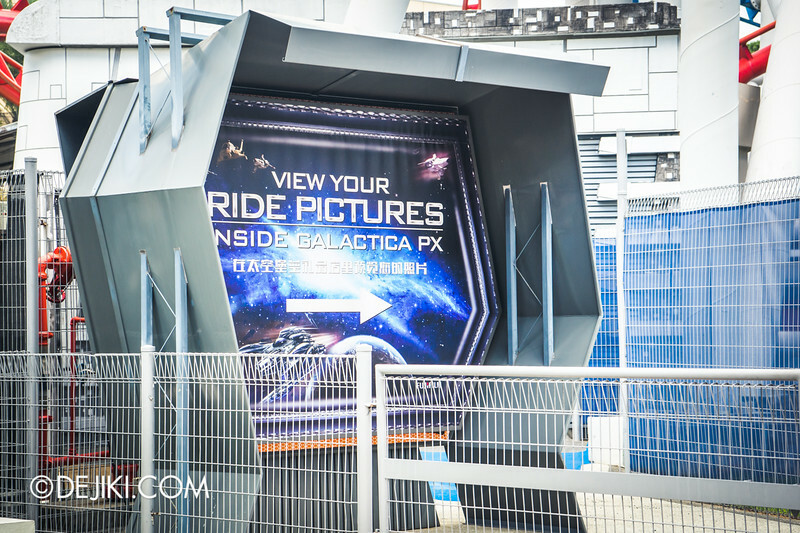 Instead, guests can view their photos at the Galactica PX store. It’s sad to see this go, as it was part of a uniquely BSG experience – you know, people could see and laugh at photos of others (until their own ‘unglam’ photo gets displayed). 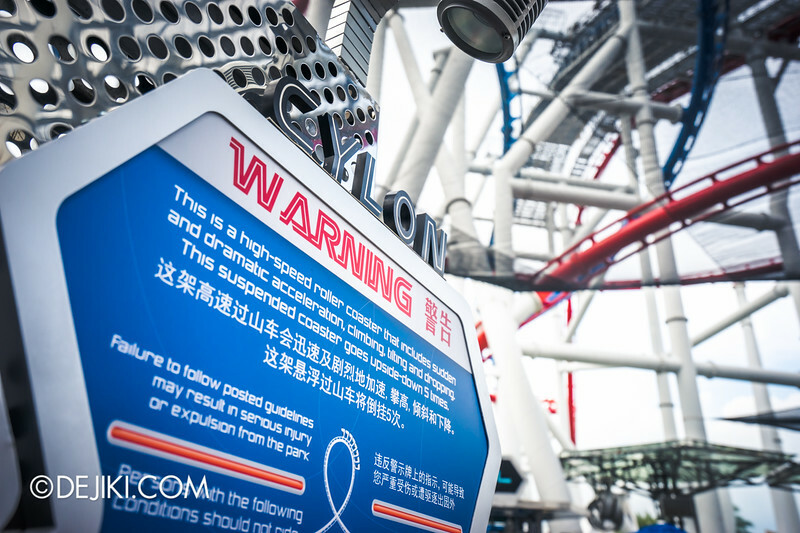 Fans were installed at the entrances of both rides. Hopefully that helps keep the crew members stationed at the entrance cool and comfortable – weather’s been really hot nowadays. Park crew members were seen enhancing many parts of Sci-Fi City theming around Battlestar Galactica, with cleaning and fresh coats of paint. 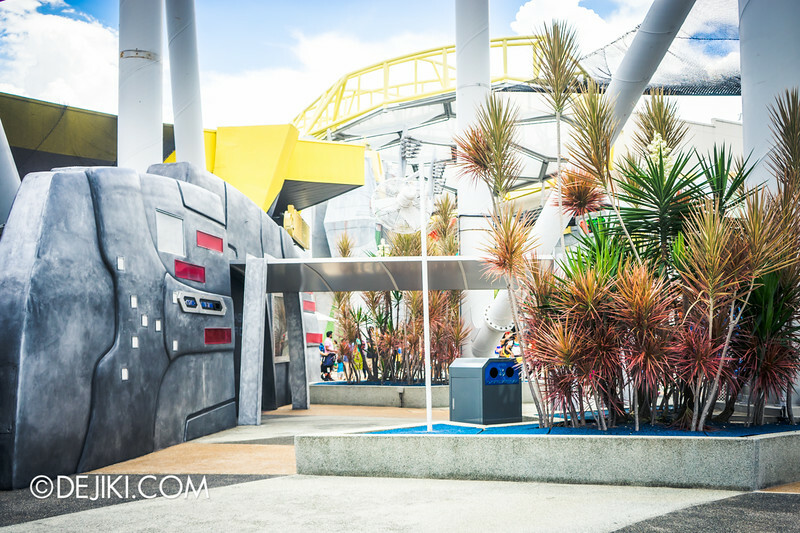 It’s nice to see the bright colours and clean metallic finishes – like the park in 2010! 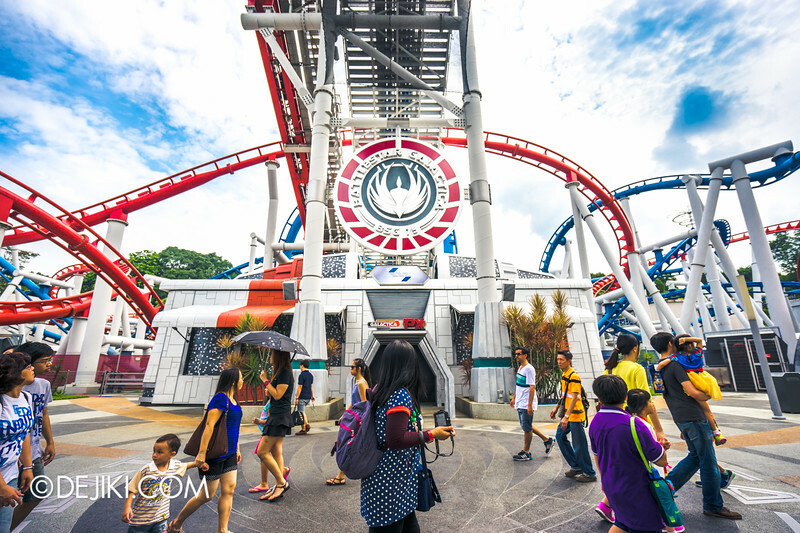 Have you gone on Universal Studios Singapore’s latest ride recently? It is the hottest roller coaster in town! 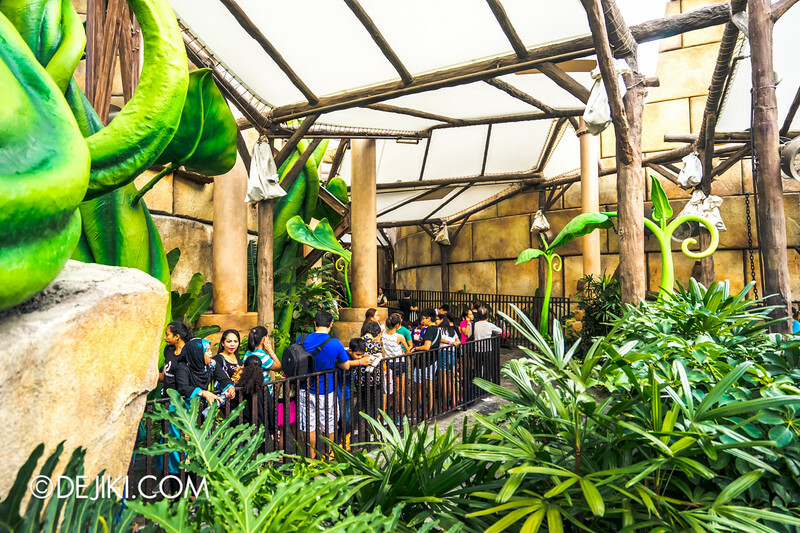 During high-peak days, wait times can go up to some 135 minutes! 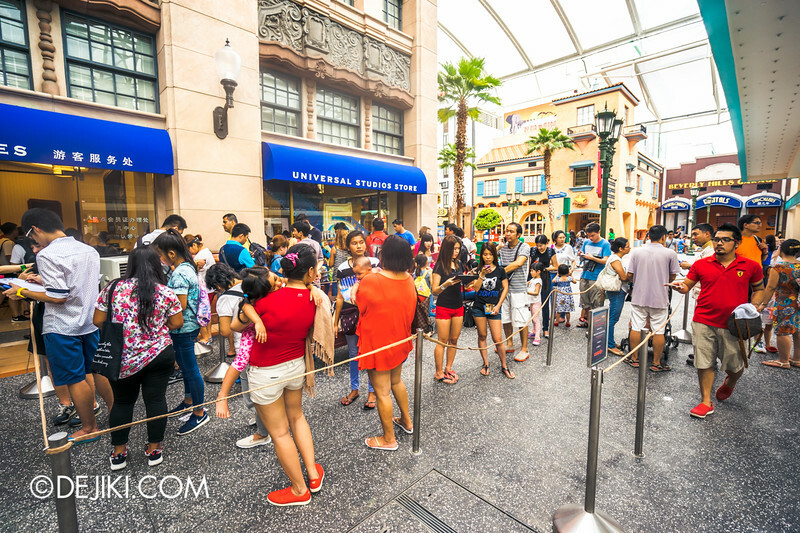 Universal Express works in Singapore in a different way (where ‘unlimited’ option is an available upgrade and there’s no ‘time limit’), so sometimes the queue in Express lane starts as far as the ride’s entrance. It’s about 45 minutes wait from there. The usual line would be at least 1.5 to 2 hours. The park seems to be displaying very conservative wait times for this ride. On the good days, the line moves very briskly as sometimes the wait can be as short as an hour even if it starts near Donkey Live. But sometimes, delays happen due to technical issues. There was one saturday that the ride was unavailable until 12:40pm. I think the park could do a bit more handling crowds at Romeo Drive, because when a temporary ride closure happens, the entire zone is swamped with people moving in two directions. Perhaps some signage, or crew members could be stationed near the start of Romeo Drive to let guests know they shouldn’t even walk towards the tower. 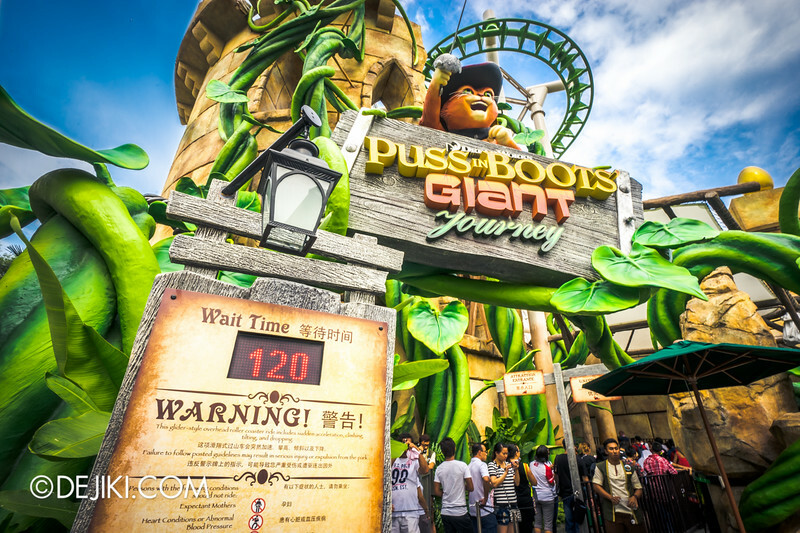 I’d suggest going on Puss in Boots early in the morning for shorter waits (if it’s open); or later in the evening when the weather is cooler. You’ll get to see the props lit in a different light. 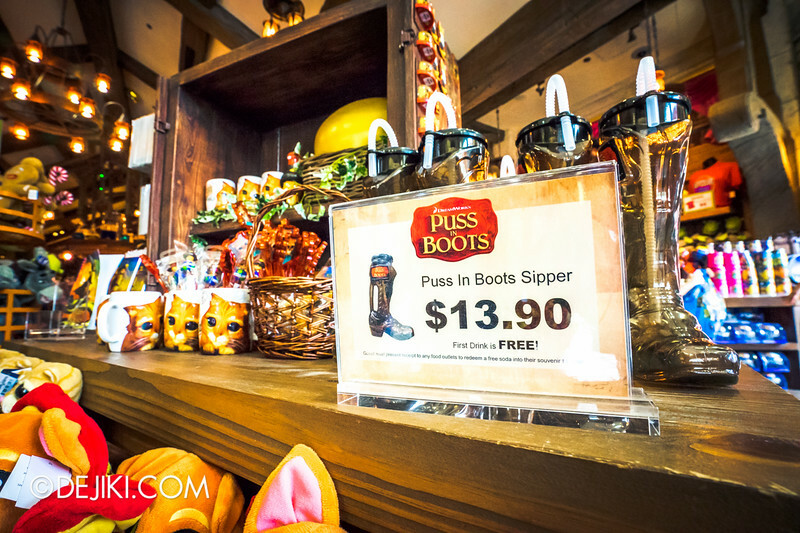 Stop by the Fairy Godmother’s Potion Shop for some new Puss in Boots goodies. Such as this Boot-shaped sipper bottle! 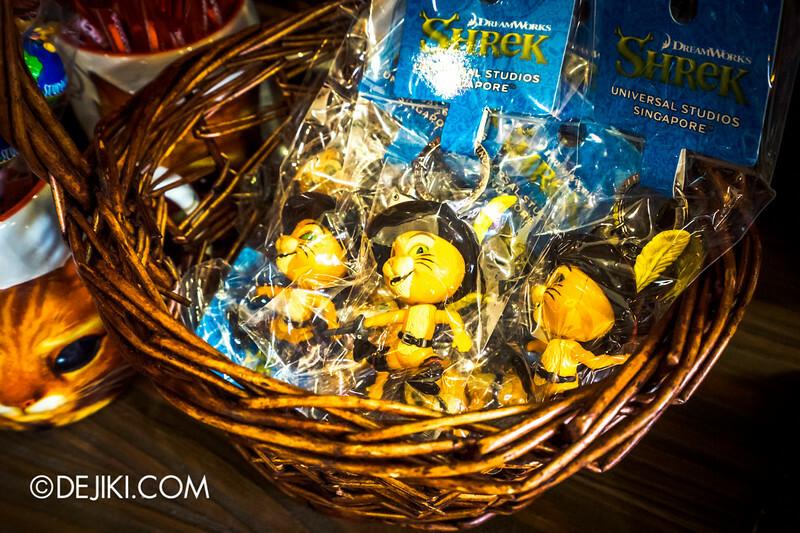 And a few cute keychains and pens featuring Puss in a cute ‘Super Deformed’ design style. 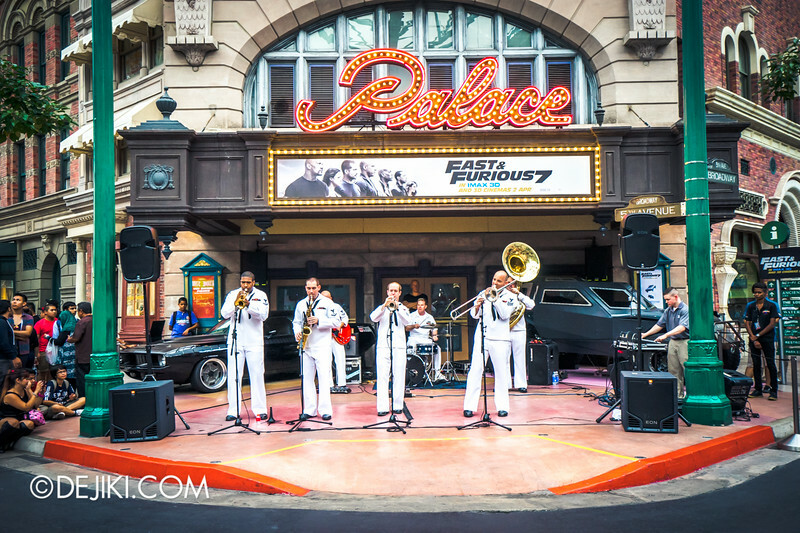 Over the May Day Weekend, the US Navy 7th Fleet Band visited the park and performed at New York on 1 and 3 May. The USS Blue Ridge embarked in Singapore on 30 April, and some of the crew and staff are participating in activities around Singapore. 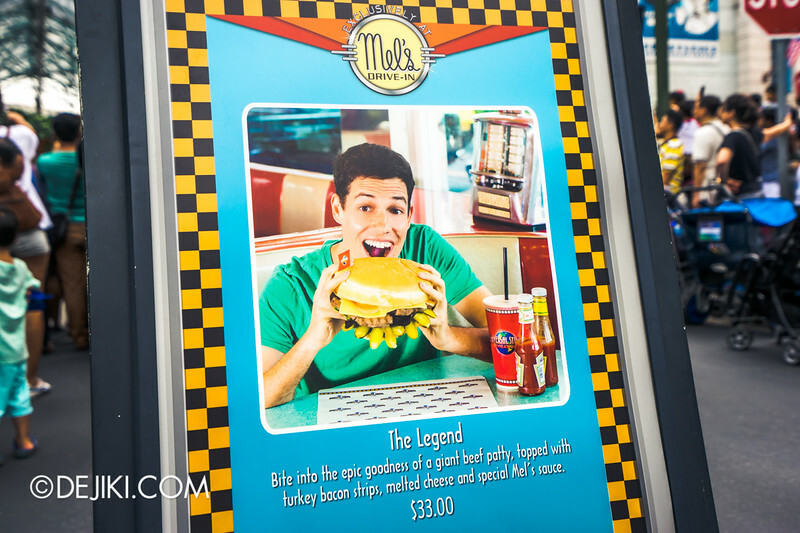 Has anyone tried The Legend at Mel’s? This gigantic burger costs S$33! Do let us know if you are, or know someone who wants to try this! 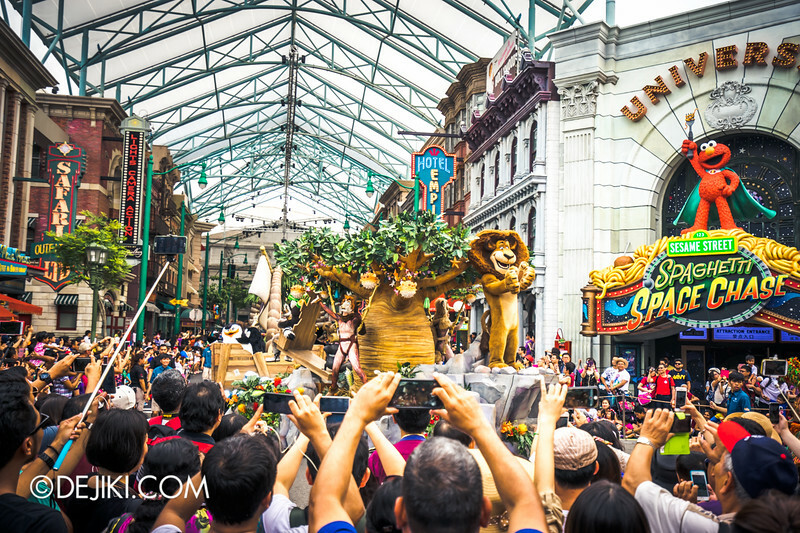 During certain holidays and long weekends, the Universal Party Parade may be performed earlier at 3pm (instead of the 5pm slot). Grab the white ‘show times’ leaflet at the park to get the day’s schedule of shows when you visit! With very affordable prices, the park’s membership programme is getting quite popular. If you intend to sign up for an Annual Pass or Season Pass, you might want to do it the first thing in the day, or leave it till sometime in the early evening, to avoid long lines. 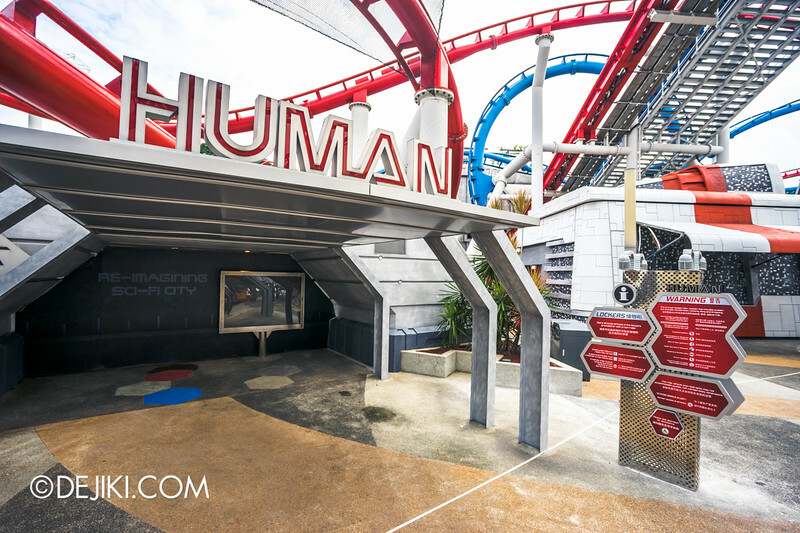 Visit the Battlestar Galactica and Cylon Basestar in our exclusive tour of Battlestar Galactica: HUMAN vs CYLON attraction. The entrance shows should be here for the long term. From the long lines at this mild family coaster it shows that there is demand for this type of attraction as opposed to say mummy. Thus I say bring on diagon alley and escape from gringotts!